Emirates has introduced a tablet-loan service to US-bound first and business class passengers. Emirates has introduced a service to mitigate the inconvenience of the recent ban on electronic devices on board US-bound flights. According to the airline, the service introduced this week, allows first and business class passengers to borrow tablets on board Emirates' US-bound flights, allowing them to continue working during their flight. Last month, the Trump administration announced new rules banning many electronic items from passenger cabins on US-bound flights from 10 airports in eight Muslim-majority nations in the Middle East and North Africa. The clampdown was prompted by reports that militant groups want to smuggle explosive devices in electronic gadgets, US officials said. "The new service is in response to the US Transportation Security Administration (TSA) directive which requires all passengers travelling on non-stop flights to the US from Dubai to check in their laptops, tablets, and other personal electronic devices larger than a smartphone," says Fouad Caunhye, regional manager, Emirates Southern Africa. "The service is complimentary and will be available on all non-stop flights from Dubai to Emirates' US destinations; this also applies to passengers from SA, as all Emirates' flights to the US go via Dubai." 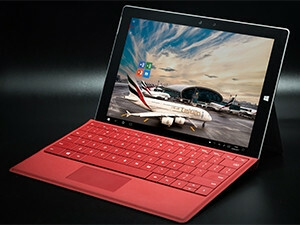 As part of this service, Emirates premium customers will have Microsoft Surface tablets equipped with Microsoft Office 2016, available for loan on board, he adds. Customers can download their work on to a USB which can be brought on board and plugged into the devices to continue working seamlessly. On 25 March, Emirates introduced a laptop and tablet handling service for US-bound customers who prefer to stow away their personal devices and enjoy the inflight entertainment and service on board, according to the airline. To date, Emirates says nearly 8 000 passengers have utilised the laptop and tablet handling service on the airline's 112 weekly non-stop flights departing Dubai International airport to cities in the US. "These two new services by Emirates give customers travelling to the US several options, such as: packing their electronic devices into their check-in baggage at their point of departure; the opportunity to use their laptops and tablet on their first leg of their journeys and during transit in Dubai, up to the moment they board their US-bound flight; and for premium customers the choice to continue working on loaned devices on board," concludes Caunhye.